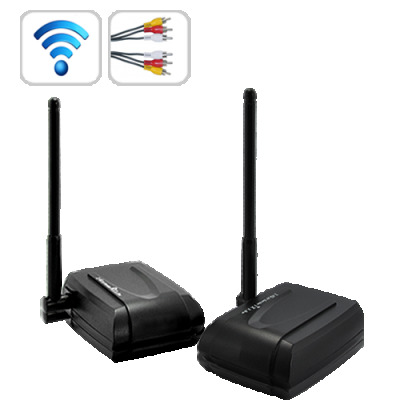 Successfully Added Wireless Audio Video Transmitter Receiver System to your Shopping Cart. Say no to wires! This incredible AV communication system features a wireless audio video transmitter and receiver set for an outstanding entertainment experience everytime without the wires. Simply plug an AV source such as a media player into the transmitter. Then plug an AV display such as a TV into the receiver. Whatever is playing on your media player is shown on your TV from across the room without any messy wires! So Easy To Use! This package comes with just six simple items. A small but powerful wireless transmitter. A compact yet sensitive wireless receiver. Two sturdy AV cables and two dependable power adapters. It's a total solution straight out of the box and here's how to make things happen. Connect the power adapter to the wireless transmitter. Connect your video source to the wireless transmitter using an AV cable. Connect the power adapter to the wireless receiver. Connect your TV to the wireless receiver with an AV cable. Play your movie file and start enjoying the freedom of a life without wires! The Possibilities Are Endless! In case you think this amazing product can only be used for watching videos, think again! The wireless AV transmitter accepts any AV IN source such as a MP4 Player, DVD Player, Stereo System, Videogame System, Camcorder, etc, and the wireless AV receiver outputs to any AV OUT source such as conventional television sets, high definition TV, LCD Displays, Plasma Displays, Handheld Monitors, etc. The possibilities are endless! At such a great price, order yours today for personal use or resale. Brought to you by the online wholesale audio video specialists - Chinavasion! AV IN: MP4 Player, DVD Player, Stereo System, Videogame System, Camcorder, etc. AV OUT: Conventional television sets, high definition TV, LCD Displays, Plasma Displays, Handheld Monitors, etc.